Studio-Mosaic: Rustic Floral based on Creative Jumpstart 2014 class. 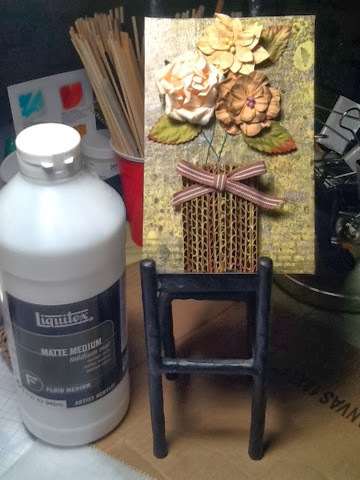 Rustic Floral based on Creative Jumpstart 2014 class. I truly enjoy taking classes online - well, if I am really honest, I enjoy taking art classes anywhere, anytime that I'm able!! One of my current online experiences is Creative Jumpstart at www.nathaliesstudio.com We had a creative jumpstart project, giveaway or show and tell each day of January open to our participation. For example, the image shown here is a finished project based on one of the classes using cardboard. I used a canvas board, Liquitex Matte Medium, Glue Dots, various paper flowers and leaves I've accumulated, some wire, ribbon and cardboard. I also brushed some Pan Pastels to highlight the front of the cardboad "vase," a technique by Marsha Valk of The Netherlands. By the way, the background was made using Citrasolv™ and a page from an old "National Geographic" magazine! Now I have a creative jumpstart using cardboard in new ways! Look for other uploads of projects I completed! Thanks to Nathalie for putting this all together!